Inserting graphics in PowerPoint 2013 is very similar to inserting them in Word. The commands on the Insert tab in both applications include buttons for inserting a graphic from a file and also for inserting online images such as clip art. 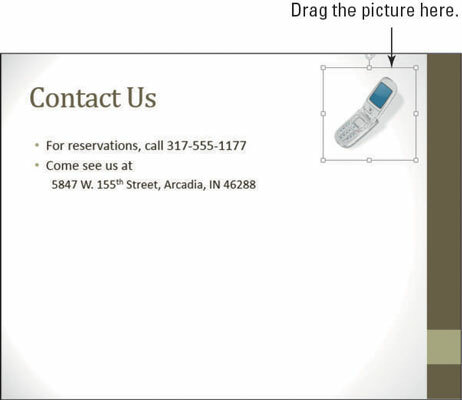 However, PowerPoint has one big difference: placeholders. You have two ways of inserting graphics in PowerPoint: via the Insert tab (as in Word) and via the icons in a content placeholder. Depending on which method you choose, the graphic behaves differently. Clip art images are line-based drawings that are compact in size and can be resized without losing quality. They aren’t very realistic-looking, though; it’s obvious that they are drawn artwork. Digital photographs are photos taken with a digital camera or scanned into a computer by using a scanner. They are very realistic, take up quite a bit of disk space, and can lose quality if you size them larger than their original size. Choose a file from one of your folders. 2Click the Online Pictures icon in the empty content placeholder box. The Insert Pictures dialog box opens, as shown in this figure. 3In the Office.com Clip Art search box, type Greek and press Enter. 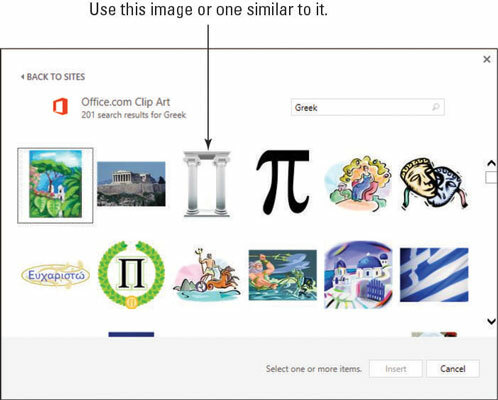 4Click an image that shows Greek columns, like the one in this figure, and then click the Insert button. The image appears in the placeholder. 5Click slide 5 to display it. 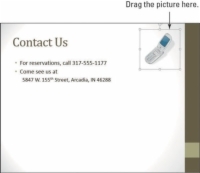 This slide has no placeholder suitable for artwork. 6Click the Insert tab and click Online Pictures. The Insert Pictures dialog box opens. It’s the same dialog box as in the figure. 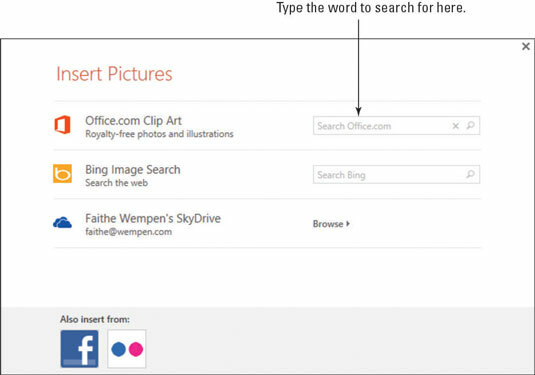 7In the Office.com Clip Art search box, type phone and press Enter. 8Click one of the clip art drawings (not a photograph) that shows a telephone and then click the Insert button. It appears in the center of the slide. 9Drag the picture to the upper-right corner of the slide, as shown.